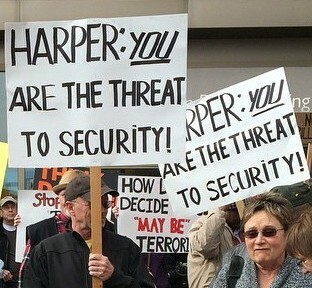 Pension security is a demand Canadians put forward at nearly every door MLPC candidates visit in this election. They are often asked how the MLPC would sort out this issue. In a flourish of fearmongering and deception, the Harper Conservatives on March 24 announced their intention to extend Canada’s military mission in Iraq and expand it to Syria as part of the U.S.-led coalition which is waging a dubious, unjust and unlawful military aggression against those countries. According to the Harper government, “Jihadi terrorism” poses a great threat not only to the people in the region but to Canada and the rest of the world. Harper and his ministers say that the “Islamic State of Iraq and Syria” (ISIS) has declared war on Canada, and to protect Canadian citizens the government will extend and expand the bombing into Syria without consulting the Syrian government. 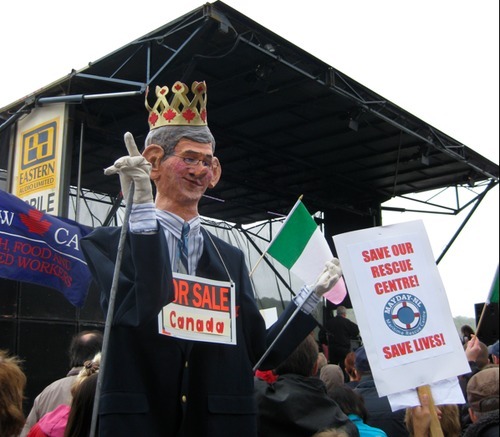 Seafarers protests called for the defeat of the Harper government and its neo-liberal Comprehensive Economic and Trade Agreement (CETA) with Europe in St. Catharines on April 1 and Montreal April 2 (pictured above).